The Aventador with its Stealth design and its snarling twelve-cylinder engine is one of the most spectacular sports cars in the world. And you need to be amongst the best of your sector – just as HAMANN MOTORSPORT is – to track down the refinement potentials of such a total work of automotive art. With such ultimate sports cars, HAMANN thinks in holistic terms and thus created the unique performance kit “Limited” with aerodynamics parts, exhaust systems and wheel/tyre combinations. At the same time, the professionals at HAMANN integrate customer requests to create distinctive unique pieces. 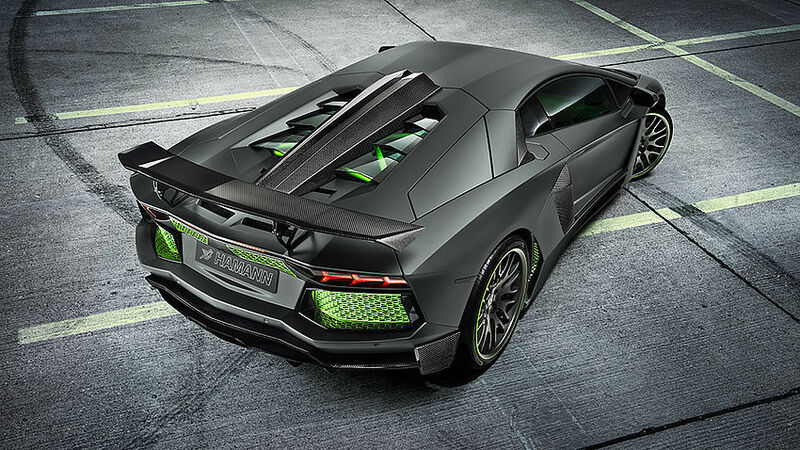 Even more uncompromising and even more spectacular – that is what the specification sheet says when HAMANN has the hottest Lamborghini on the lifting platform. With its “Limited” package the Swabian manufacturer has developed an individualised masterpiece with unique design details. These include air vent inserts for the front plus spoiler, side skirts and an adjustable rear wing made of ultra-lightweight carbon fibre. All these measures support aerodynamics and ensure more down force and thus increase the grip. The rear had the greatest demand for optimisation. 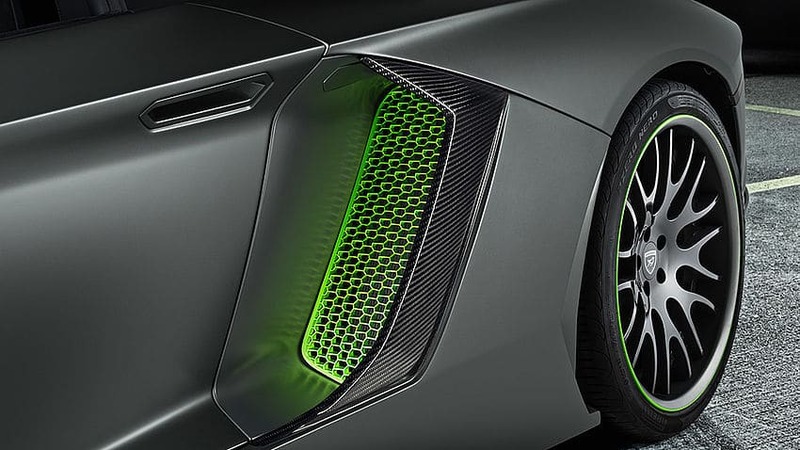 This is realised by carbon-fibre parts from motorsports to optimise diffuser and rear skirt. Accurately fitting aerodynamics kits are one of HAMANN’s specialties. They are exclusively built and adapted with the utmost of precision. To supply the 6.5-litre twelve-cylinder unit with enough cool air for the output enhancement, HAMANN installs voluminous air intake slots on the engine compartment lid. Beneath, it gets hotter than ever before. 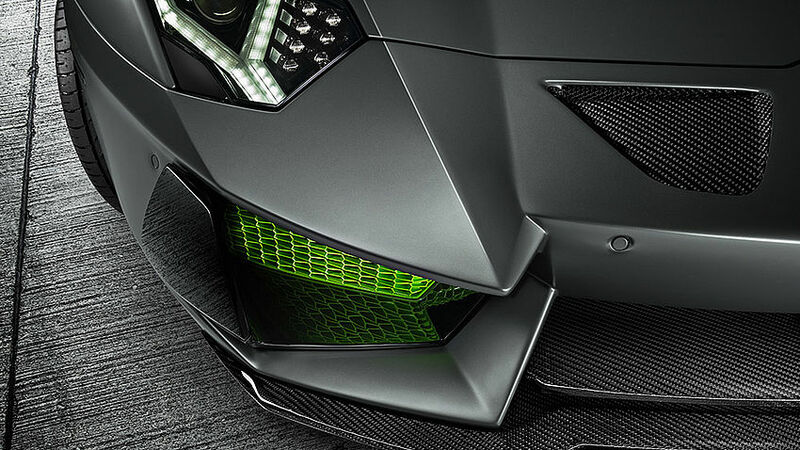 The completely revised software of the control unit boosts the Aventador’s output from 700 to 760 hp (515-559 kW). At the same time, thanks to optimising the ignition map of the standard motronic, the peak torque grows from 690 to 735 Nm. And for the ultimate sound the refiner from Laupheim installs a matched set of sport rear mufflers. The mufflers made of premium stainless steel are perfectly and seamlessly integrated into the rear. Those opting for the Race version will enjoy the “backfire” effect.